Tonight during its CES keynote detailed what it means about the future of mobility including self-driving cars and connected technologies. 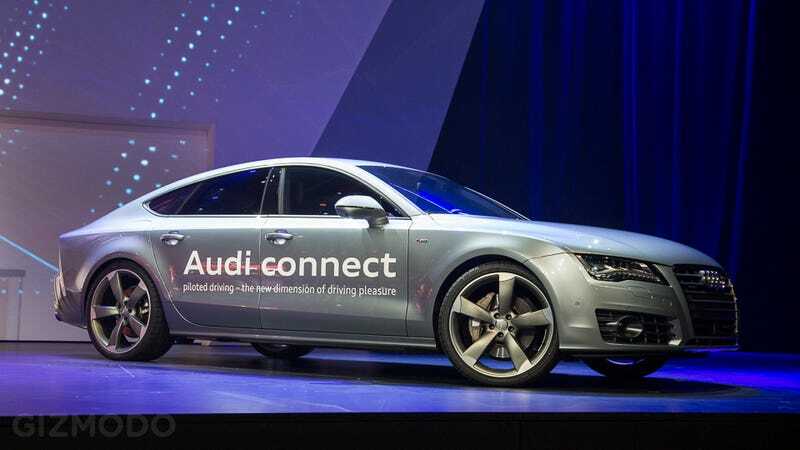 Importantly, it detailed the brain that will ultimately allow a car to drive itself—by rolling out its "piloted A7". The car is gorgeous, as for the brain, it looks like a massive computer motherboard about the size of an iPad. And that's about as far as Audi got in its presentation it had figured out how to make the technology work—but not exactly plans to actually release it. All the company really did was wave silicon around on the stage, but it claims that it's figured out how to scale piloted driving and implement it in away that's actually safe. Besides self-driving cars, Audi discussed some of its concepts for its future oin-car connected infotainment systems. AT&T CEO Ralph de la Vega said his company will be providing the LTE connectivity for its future infotainment systems. The brains for these systems will be powered by Nvidia's crazy 192-core Tegra K1. Another crazy touch was a new infotainment concept interface for a screen that shows up directly in your dash. In the shot above you see how your dashboard magically transforms into Google Maps. So the LTE and Nvidia chipsets are actually coming to Audi vehicles. As for Audi's utopian vision for the future of society once we no longer have to think about driving...we'll see.